As a researcher and professor of Mythology and Folklore at Harvard University, Aileen Callas wants to do much more than tell her students some old, barely authentic stories. She wants to prove the myths are real. After all, one of these ancient myths saved her life as a child. A dark prophecy warns against prying. Undeterred, Aileen assembles a team of investigators and sets on a journey in pursuit of the truth. Unaware of the danger, Aileen steps into the dragon’s cave. Lured by her beauty, Drakon can’t decide if he wants to turn her into dinner, or sweep her off her feet. He wants to eat her (in more ways than one), she wants to save him. But there are vile men on Aileen’s trail, and all they want is to kill the dragon, steal the Golden Fleece, and get rid of the expert in Greek Mythology. Aileen Callas has been obsessed since childhood with mythology, specifically Jason & The Golden Fleece. You see she is a direct descendant of Medea, the witch that put the Guardian of the Fleece to sleep all those millennia ago, so her love would not follow her. Did Media have an ulterior motive to her actions, did she as a witch have the gift to see into the future? Aileen is a professor of Mythology, but she has it in her head that the story of Jason & The Golden Fleece, more specifically the Guardian is all too real and she is going to prove it to the world. She never thought that her quest would bring her face to face with a pissed off dragon! Drakon has been guarding the fleece for so long as a dragon that all his humanity is gone and he knows not for what, he can't even sleep because of the curse, only kill any that dare try to possess the fleece. Would that the curse be gone, or he could die. When the dragon instead of killing sits and listens to the human who has dared enter his cave, he is mesmerized and after years of not shifting to his human the shift comes upon him and he realizes that Medea had her reasons for what she did. Love the mythology in this story, not the same old story we've always heard in books and the movie Jason and the Argonauts, this was a different and very enjoyable version. This is a great addition to the Zodiac Shifters series. This is a standalone story that pulls you right into the plot and keeps you engaged throughout the whole book. There's action, adventure, drama, danger, suspense, enemies, twists/turns, intrigue, secrets/mystery, betrayal, justice, humor, frustration, fright, romance, passion/lust and love. This is a mythical story and the heroine is searching for proof that it was a reality and not a myth. Aileen Calls a is a professor of Mythology and Folklore at Harvard University. She has been obsessed with the mythology of Jason and the Golden Fleece. She is a direct descendant of Medea, the witch. She goes looking for it with some of her students to show them proof that it's real. But, she got more than she bargain for. Drakon is a cursed Dragon who is guarding an ancient treasure. He was cursed by Medea who he loved and has been guarding the fleece for so long that all his humanity is gone. One day, a human female runs into his cave and let the fun begin. Read is amazing story to find out what happens. I voluntarily reviewed this advanced reader copy and this review is my own opinion. 5.0 out of 5 starsIs the Golden Fleece real-find out for yourselves! Aileen Callas is a Professor of Mythology & Folklore at the Harvard University and wants to prove a theory she has about Jason and the Golden Fleece. Unfortunately there are others also interested in the quest which proves dangerous to Aileen and her companions. She's also in for quite a surprise. Can't tell you how much I loved this intriguing story, loved the characters and this book grabs you in from the beginning until the end. A fascinating way to bring Greek Mythology into our century. Has adventure, suspense, danger and romance. I highly recommend this book and the many others in the Zodiac Shifters series! I really enjoyed this story. Aileen has been saved by dragon tears as a child which caused her to devote her life to mythology specifically the story of Jason and the Golden Fleece. Aileen is the descendant of Medea the enchantress who put the Guardian asleep for she fell in love with the man who was also a dragon. 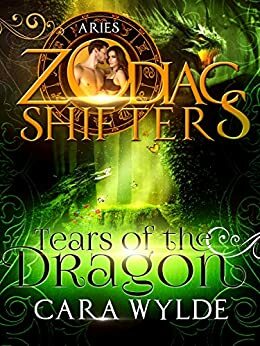 This is part of the Zodiac Shifters series and I'm not sure how this related to the zodiac at all. Maybe I missed it but this doesn't take away the fact that I fell in love with Drakon and his story. His tears saved Aileen and somehow she would save him from his curse. A beautiful story which I highly recommend as it warmed my hear on such a cold morning. Do yourself a favor if you love dragons, mythology and a fantasy all entwined grab a copy because this is a great story. A professor is the descendant of Medusa trying to disprove the Guardian of the Golden Fleece story is false. She and three others make a documentary filming their trip into the mountain. The characters are relatable, interesting, and dramatic in their belief of the Golden Fleece. The plot is unusual and intriguing leading to an exciting story that twist in a dramatic way. I would highly recommend this book for somebody who would like to read about characters like Indiana Jones or Laura Croft. 4.0 out of 5 starsA new twist on Jason and Medea! Greek Mythology and PNR merge seamlessly into a great little story! Aileen may be a Professor but some her ideas are a little...left of field for her colleagues. But with her intrepid assistant and camera man she is deep in the heart of ancient Colchis, looking for the golden fleece and its guardian! Her camp is attacked and she makes it to the safety of a cave but what awaits inside? Safety for further danger? Great re-imagining of the myth of Jason and Medea. Aileen certainly wasn't the plain Academic - she had many secrets of her own to hide. I loved the pace which was just right. I just wanted it to be longer honestly!